For most people, a job is something that has to be done. Even it the job pays well, there is the chance that it requires a lot of stress. One of the jobs that pay well is air traffic controller. However, it is often considered one of the most stressful jobs out there. Some jobs, though, are fun and pay well to boot. However, if you are going to do these fun jobs, you have to be at the top of your game. As with most things, if you want to reach the pinnacle of your career, and if you want to make a good salary, it requires some hard work… and you need to be good at what you do. But it’s easier to be good at what you do if you have a fun job. If you like chocolate, and you are very skilled, or good at marketing, you can make as much as $90,000 a year. Of course, most chocolatiers don’t get to that level. But if you could reach that point, you could make a good salary. And maybe even enjoy job perks like free chocolate. Most young children dream of being astronauts. Interestingly enough, it’s possible for anyone in good physical condition, with the right qualifications (preferably a college degree), can apply to be an astronaut. Depending on your qualifications, you can earn between $65,000 and $100,000 a year… if you are selected. Do you want to help others find an appreciation for nature. According to Today.com, park rangers feel good about their jobs. And you can get paid $47,000 a year. That’s not bad for a job that you feel is important, and if you rise to be a supervisor, you can make more than $57,000 a year. Make $49,000 a year or more as a magician. Learn magic tricks, and entertain others. It can be fun to continue to learn new tricks, and to make people happy. Some magicians (think Criss Angel) can make millions of dollars each year. If you are talented with graphic design, and if you are a good story teller, you could make up to $70,000 a year as a video game designer. Use your imagination, and work in a field that allows you to be involved with some of your favorite activities. Normally, though, you need the right degree, and it helps to be at the top of your field. You can make more than $90,000 a year as a winemaker. You don’t even have to own your own winery to be a winemaker. If you know what you’re doing, you can run someone else’s winery and receive very good pay to do something you love. This is a perfect job for the oenophile who wants to spend days doing something fun and interesting. If you have a hobby that you think would make a good job, you just might be able to make money at it. You could even make a really good living, and never be bored. This is great to know, as people say its never too late to realize your passion. People should always pursuit their passion not paying attention about the earnings, even though thats what makes your life. Be happy! Who doesn’t like magic?! 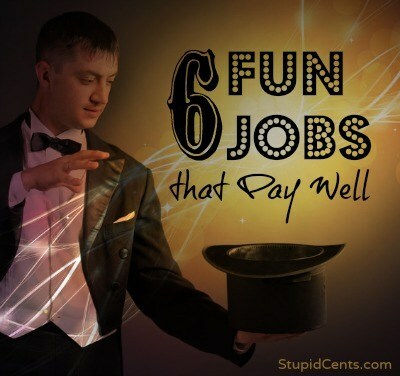 Who knew you could be paid such a great salary for doing magic tricks!